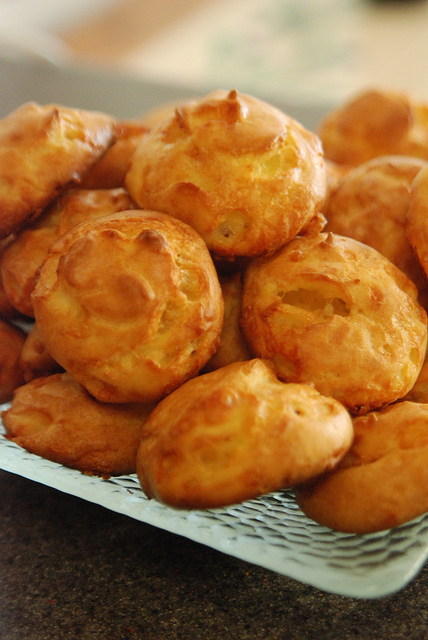 Here’s an easy recipe for Gougères…and did you know they’re easy to make ahead and freeze? Read on. These savory little cheese puffs are a common but much-loved recipe in the bonne femme’s entertaining repertoire. They make excellent party bites—a satisfying nibble all on their own. Just line them up on a platter and watch them disappear. Yet, like crackers, they can also work as a blank slate upon which to present other ingredients. Slice them open and tuck in a savory filling, such as chicken salad, cream cheese mixed with tapenade, or a slice of salami or prosciutto. 1. Preheat the oven to 400°F. Line a baking sheet with parchment. 2. In a small bowl, stir together the flour, salt, dry mustard, and cayenne; set aside. 3. In a medium-size saucepan, heat the milk and butter over medium heat until the butter is melted and the milk comes to a boil. Add the flour mixture all at once to the milk mixture. Beat with a wooden spoon until the mixture pulls away from the sides of the pan. Cook and stir for 1 minute more. Remove the pan from the heat and let the mixture cool for 10 minutes. 4. Add the eggs, one at a time, beating the first until it is completely incorporated and the dough is smooth before adding the second. Beat in the cheese. 5. Use a pastry bag to pipe 20 to 24 mounds of the dough onto the baking sheet. (Alternatively, the dough may be dropped by tablespoons.) If you prefer even tops, smooth the tip of each mound with a finger dipped in water. Personally, I prefer the somewhat craggy tops—they lend a more fanciful, airy appeal to the pastry. 6. Bake the gougères for 15 minutes. Reduce the oven temperature to 350°F. Continue to bake until golden brown on the outside, 8 to 10 minutes more. The insides should be dry but soft—pull one open to test it. Transfer to a wire rack to cool. Serve warm or at room temperature. Make-Ahead Instructions: Here’s how to freeze gougères. These positively disappeared at a party we hosted recently. Even though mine looked a little spread out, they were very tasty–and they did fine after being frozen for a few days. I used one of those pastry “guns” (from Pampered Chef) to make them and that worked very well. Wonderful……..fantastic recipe…I’ve passed along the link to my Facebook friends. Can’t wait to make a new batch and freeze them. I quadrupled the recipe (maybe that was the problem) and while they’re very tasty, they really flattened out during cooking. Definitely not puffs… do you know why that may have happened? Interesting! I find that when it comes to baking, it never works to halve or double/quadruple, etc. recipes. There’s such a science to it. It’s all so exacting. Thanks for the heads up. How long will these stay fresh if I don’t freeze them? I’d eat them within the day! But truly, if you have any leftovers, definitely pop them in the freezer and pull them out as needed. They take so little time to reheat, and they’re a terrific little treat.